Swing Trading Dashboard Indicator with 2 FREE BONUSES! Your price: $37.00 87% OFF Retail! 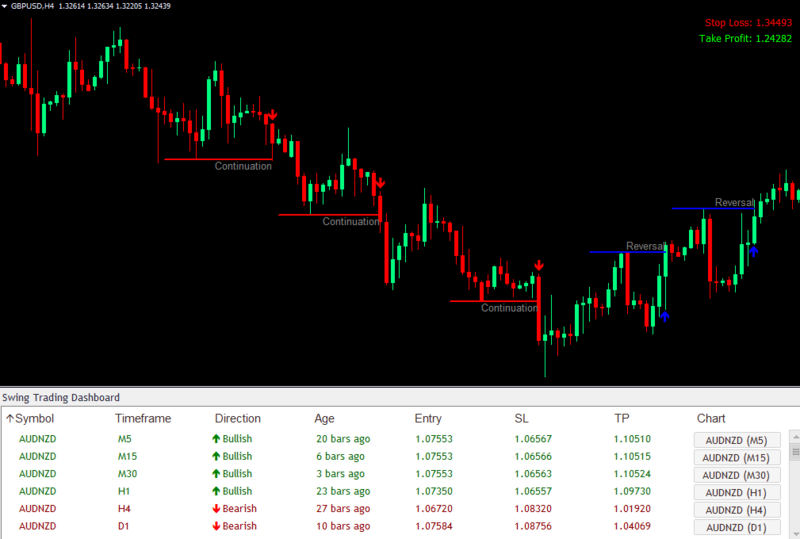 Content: Swing Trading Dashboard Indicator, PDF. Using this dashboard is super easy, and it could help you find winning swing trades in 5 minutes or less. 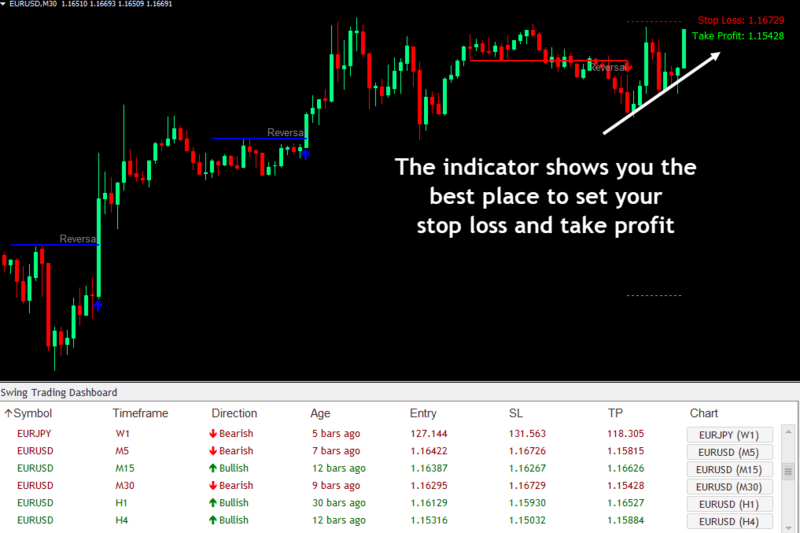 As close as it gets to a complete, AUTOMATED swing trading solution: The indicator shows you accurate entries and exactly where to place your stop loss and take profit. 6 months ago, I released the Swing Force indicator. And it quickly became our best-selling indicator. For the first time, we’ve successfully combined support/resistance breakouts AND time-tested, proven price patterns to create this ULTIMATE trading machine. 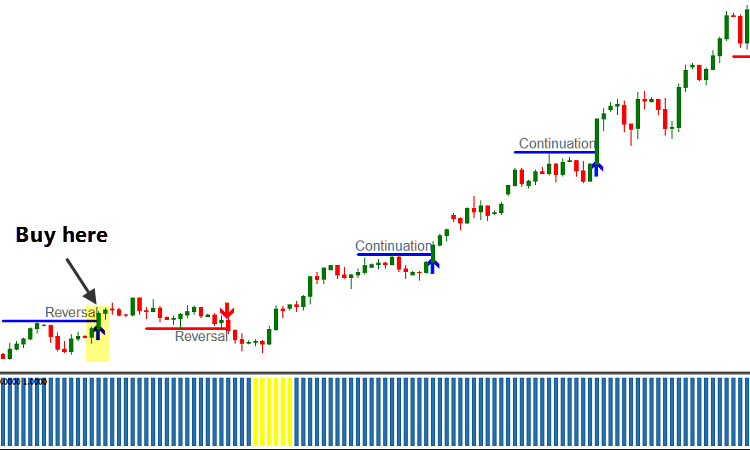 The “Swing Force” indicator gives you a timely alert whenever a trend continuation or trend reversal trade set-up appears. These high-probability trade setups are often followed by big market moves. And they are very reliable because these setups are confirmed by TWO factors: strong breakout from support / resistance levels AND high-probability price action patterns. So you can be confident entering a trade. No stress. No doubt. No uncertainty. 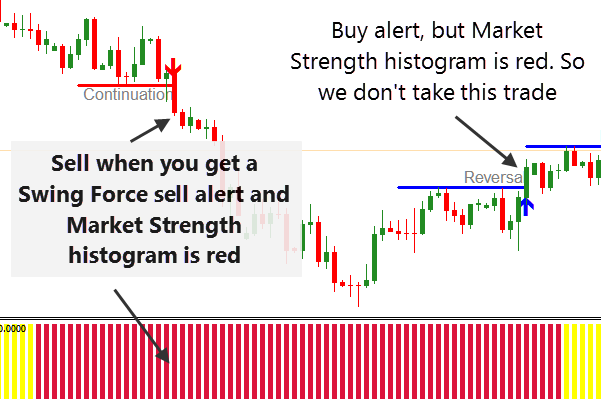 In this case, when the market breaks out of a trading range, Swing Force indicator identifies a high-probability setup and gives you a reversal alert. This turns out to be the beginning of a strong uptrend. 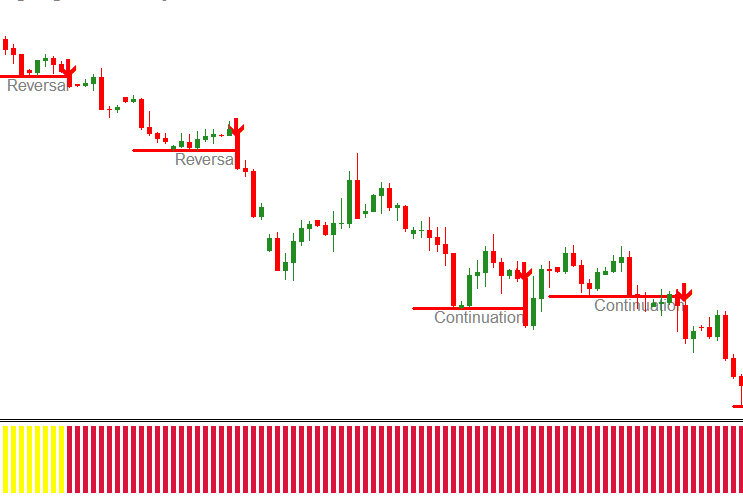 Then, after a retracement, the indicator detects a continuation setup and generates a signal. And sure enough, the price moves up immediately afterward. 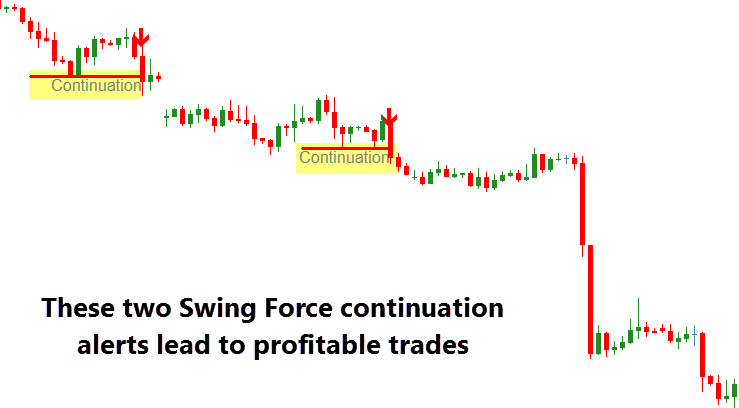 Here’s exactly the secret behind Swing Force’s accuracy: The indicator uses 2 stringent criteria to identify continuation or reversal trade setups: Strong breakout from support / resistance levels… AND… High-probability price action patterns. That way, you can be confident that whenever you get a Swing Force alert, there’s a great chance that a favorable market move is going to occur. 1. Buy when you get a buy alert. Sell when you get a sell alert. 2. Set your first profit target equal to the Average True Range value. Set your second profit target equal to 2X the Average True Range value. As you can see, for each of these alerts, almost immediately after we place our short trades, the market starts to move in our favor. 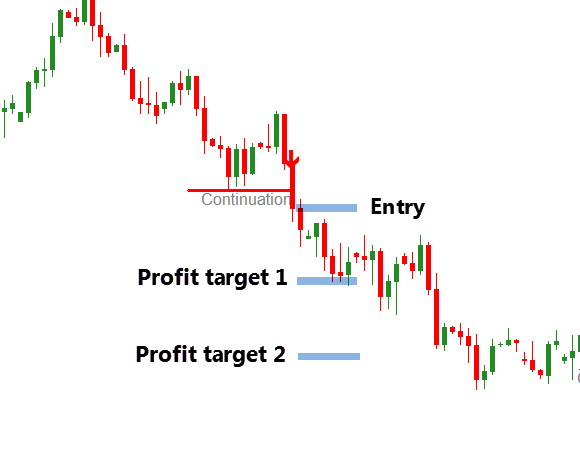 First and second profit targets are both triggered not long afterwards. Nice & easy trades, don’t you think? In this example, when the price breaks out of the previous support level, and Swing Force indicator detects a continuation setup, we place our short trade. After that, the market keeps going down, and hits profit target 1 and profit target 2. We’ve got another winning trade. Recently we discovered an advanced strategy to use the Swing Force indicator in order to boost its accuracy even more. 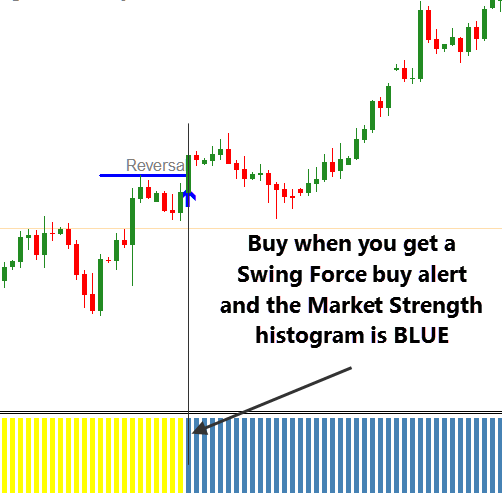 With this strategy, we combine Swing Force with another of our custom indicators — the Market Strength indicator (which we will also give you as a free bonus when you get the Swing Force indicator). So, for this advanced method, we only buy when we get a Swing Force buy alert AND the Market Strength histogram is blue. And we only sell when we get a Swing Force sell alert AND the Market Strength histogram is red. And if the Market Strength histogram is yellow, the market is ranging, and we wouldn’t want to take any long or short trade. In the photo above, we also get a Swing Force buy alert. But at that time, the Market Strength histogram is red. So we don’t take the trade. A few bars later, there’s another Swing Force buy alert. This time, Market Strength is blue. Our criteria are fulfilled, so we enter a long trade. As expected, right after we buy, the price starts to move up aggressively. This turns out to be the beginning of a huge, gigantic uptrend. Both of our profit targets are hit. And do you also notice that if you used a trailing stop in this trade, you would have even more profits? This shows that a Swing Force signal usually result in those big moves that you can easily take advantage of. Breakout trades can’t get easier than this, right? The Swing Force indicator gets you in the trend when it begins. Then, as the trend progresses, the indicator gives you Continuation signals when there’s high probability that the trend will likely continue. Here you can see, at the beginning of this downtrend, Swing Force gives you 2 reversal signals when the market switches from uptrend to ranging to downtrend. Then, as the trend progresses, the indicator gives you additional continuation signals. This tells you that you should not exit your short trades yet. And depending your risk tolerance, you can also enter more short trades. This way, you can get the most out of this downtrend. In this case, the market switches from downtrend to ranging to uptrend. 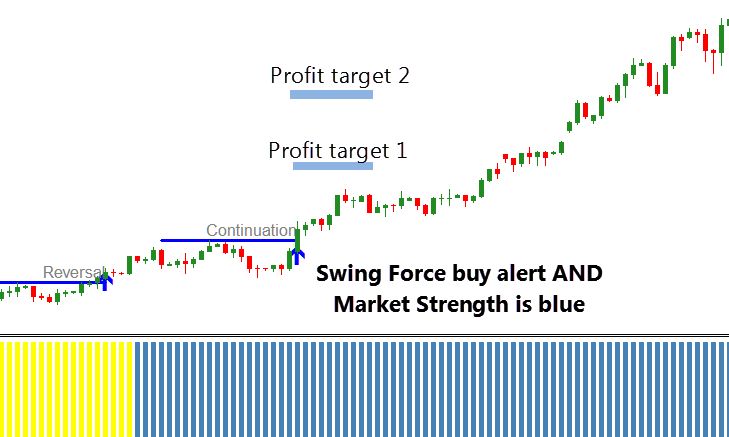 Swing Force indicator identifies those turning points, and gives you 2 reversal alerts. Then, when it gives you the third buy alert, the market is now confirmed to be in an uptrend (Market Strength histogram has turned blue). So you place a long trade. As it turns out, this is the very beginning of a huge uptrend. So you got a highly profitable (and easy) trade. So 6 months ago, we released the Swing Force indicator. Out of the blue, it quickly became our best-selling product. Among the emails we received from happy Swing Force customers, one stands out. He said: “Swing Force works. No doubt about it. But I trade 10 currency pairs plus gold and S&P500. What if we could add a Multi-Symbol Multi-Timeframe SCANNING feature to the Swing Force indicator? What if we could develop some kind of “Swing Trading Dashboard” indicator that SCANS all the pairs you want to trade, on ALL time-frames for the highest-probability trade setups? And shows you all the recently formed trade setups in all markets, on all timeframes on ONE beautiful, easy-to-use dashboard. I’m happy to say: I’VE DONE IT. 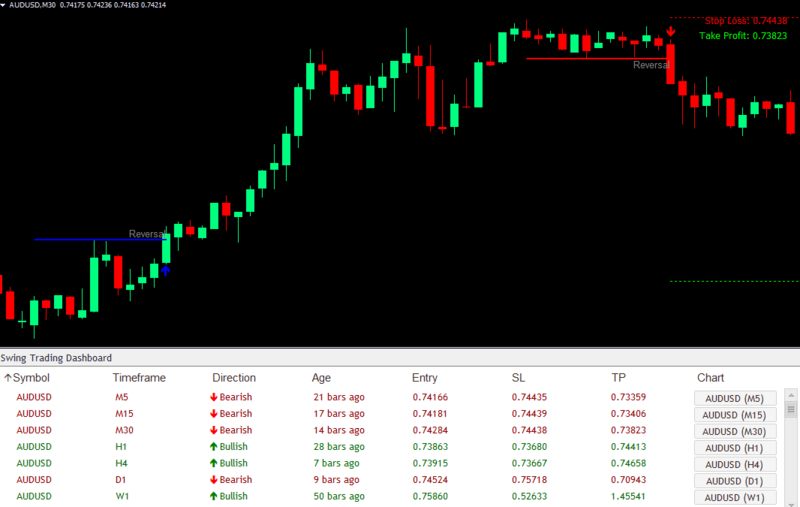 The Swing Trading Dashboard indicator displays all detected swing trade setups in ONE convenient, easy-to-use dashboard. You no longer need to manually scan every pair and time-frame. The dashboard does all the hard work for you. First, it will scan ALL currency pairs and ALL time-frames for the highest-probability continuation & reversal swing trade setups you could ever find. And all these calculations are done so fast – literally within seconds – you won’t even notice the time. Second, the indicator will display a beautiful dashboard on your chart where you can see exactly what swing trade setup has recently formed on EVERY pair, EVERY time-frame. With just one look at the dashboard, you’ll instantly know all the information you need to make a good trading decision. You’ll instantly know which reversal & continuation trade setup appears on every time-frame (from 1-minute to monthly) and on every currency pair. Not only that, you’ll also know the exact direction of that pattern – whether it’s bullish or bearish. And you’ll know exactly how long ago that particular setup showed up. Remember, you can specify as many pairs as you like. You can also use it for indices, stocks, futures, and gold (anything your broker offers in Metatrader). Our Swing Trading Dashboard takes care of it all. 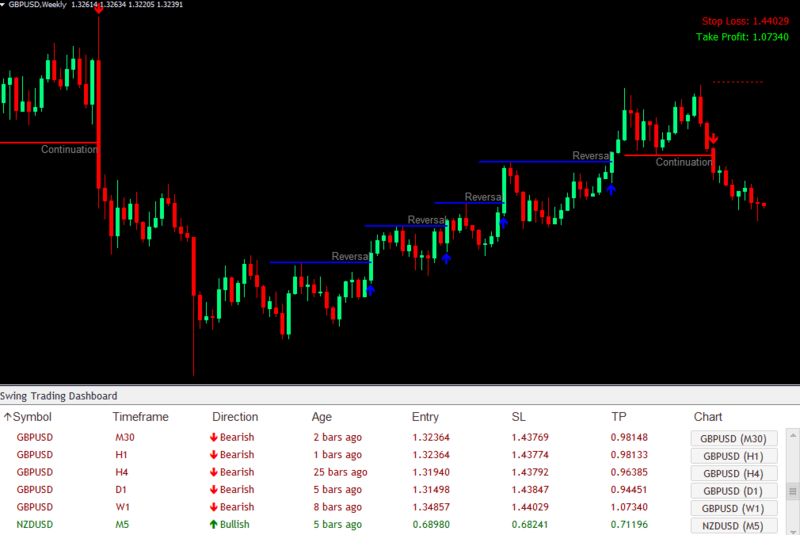 That way, you can look at the dashboard first to see the overall picture across multiple time-frames. Then once you identify a pattern that you want to trade, just click on the symbol to open up the relevant chart, so you can analyze the pattern further. So you’ll never miss out on another important trade. 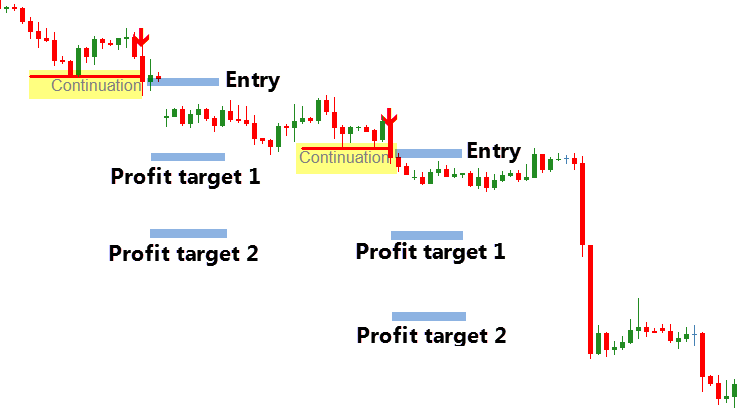 Once a trade entry is triggered, the indicator will show you the best place to place your stop loss and take profit. It does all of the hard work for you. 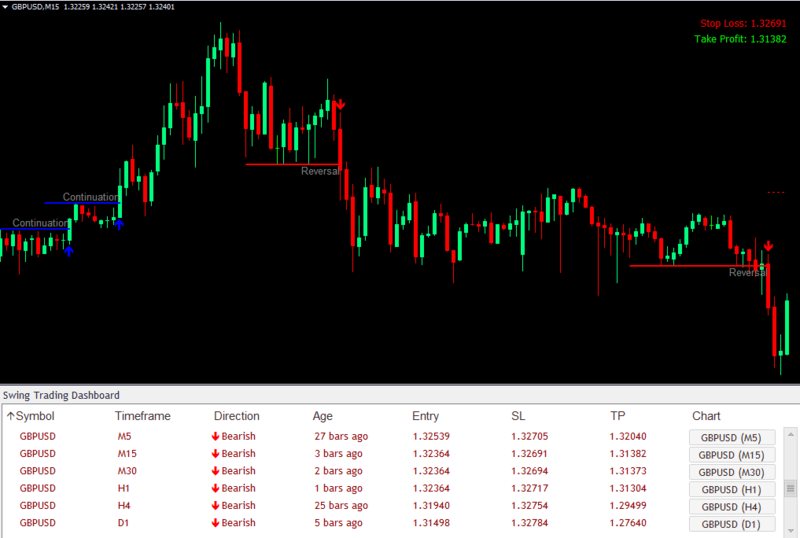 You no longer have to guess when to enter or where to set your stop loss & take profit. Everything’s taken care of. You don’t have to lift a finger. But during this official launch, you can grab it for just $99. It’s 50% OFF if you take action quickly. A perfect companion to Swing Trading Dashboard. The Swing Force indicator is perfect for you if you’d like to identify all the best swing trade setups on a single currency pair. Fast, lightweight, and efficient. 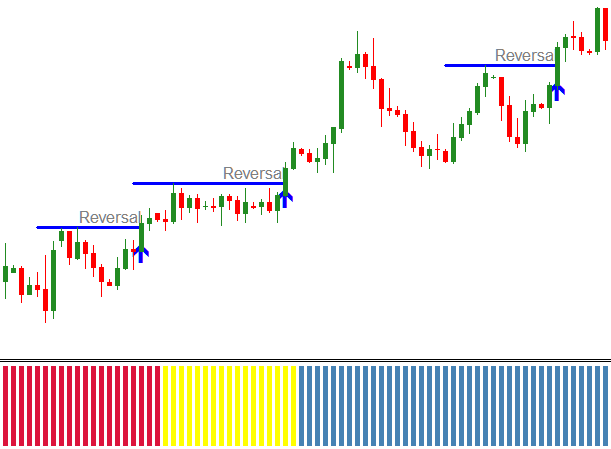 This indicator will automatically detect all of the highest probability swing trade setups for you. Retail price: $99. But today you’ll get it free when you invest in the Swing Trading Dashboard indicator. When the clock strikes midnight on July 20, we’ll be closing it down. Please don’t email our support team if you’re too late. No exceptions can be made. This special offer ends in a few days… or… as soon as the last few spots I set aside for this offer are all gone. – This is a one-time payment, NOT a subscription. – Please remember: There are no refunds and all sales are final.